“MU and CAFNR played a very important role in shaping Congressman Litton’s career,” said Edwin Turner, college fraternity brother and Vice President of the Jerry Litton Family Memorial Foundation. Jerry Lon Litton was born in a farmhouse without plumbing or electricity near Lock Springs, Missouri, on May 12, 1937. During his youth, an accident disabled his father, so his mother supported the family by selling milk from the family’s eleven cows. While a student at Chillicothe High School, Litton served as president of both the National Honor Society and the Chillicothe Chapter of Future Farmers of America. In 1956-57 the FFA elected him as national secretary. 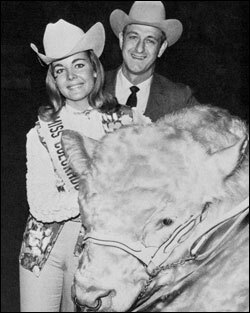 The Littons were one of the first to take their Charolais on the road to shows across the country in … Expand ▸The Littons were one of the first to take their Charolais on the road to shows across the country in an effort to draw attention to this new breed of cattle which ofered advantages to the American cattleman. Litton graduated from the MU College of Agriculture in 1961 with a bachelor’s degree in agricultural journalism and a minor in economics. He returned to Chillicothe and joined his parents in a highly successful cattle-breeding business. Before he began his political career, he was active in promoting youth involvement in leadership in agriculture and rural communities. 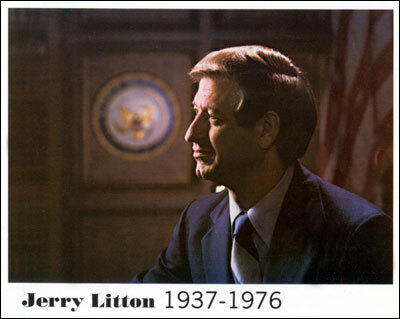 In 1972, Litton was elected to the U.S. House of Representatives, where he advocated the rights of farmers and hardworking citizens. Often referred to as a “breath of fresh air in Washington,” Litton impressed his colleagues with his honesty and his political incorruptibility. House Majority Leader Thomas “Tip” O’Neal claimed that in his 22 years in Congress he had never been more impressed by a freshman congressman than by Jerry Litton. The Congressional Club, which Litton conceived and organized in his district, sponsored a monthly television program, “Dialogue with Litton,” that aired statewide. Open to the public, these meetings offered voters a chance to ask questions and state their concerns about political issues. 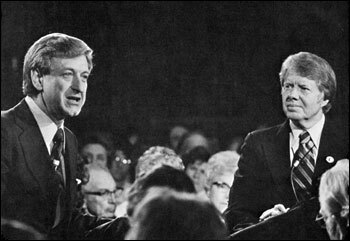 For each show Litton invited a guest, including such prominent political figures as Senator Hubert Humphrey and Georgia Governor Jimmy Carter, who said that he thought Litton would be President one day. Litton decided to seek the seat of retiring U.S. Senator Stuart Symington in 1976. He handily defeated the incumbent’s son, James Symington, and former governor Warren Hearnes in the Democratic primary on August 3, 1976. That same evening, Litton, his wife, Sharon, and their two children, Linda and Scott, along with their pilot and the pilot’s son, died in a plane crash just after takeoff from Chillicothe Airport en route to a victory celebration in Kansas City. Guests on "Dialogue with Litton" included Congresswoman Shirley Chisholm, Agriculture … Expand ▸Guests on "Dialogue with Litton" included Congresswoman Shirley Chisholm, Agriculture Secretary Earl Butz, former Vice President Hubery Humphrey, President Ford's campaign manager Bo Callaway, FDR Jr., five democratic presidential candidates, Speaker of the House Carl Albert, and a host of other well known personalities.